By Arfa Mirza in Freelance. Updated on April 9, 2018 . I had ordered a special cake for a friend’s birthday and had given the receptionist all the specifications for the cake. When I went back to pick up the cake, it turned out to be nothing like what I had expected. I took the cake with a heavy heart but on the way I kept thinking that if only the bakery would devise a particular pattern to collect information from the customers, it would not have been difficult to give custmers like me what we wanted. 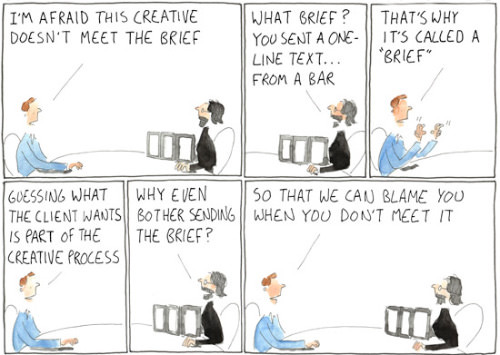 The bakery incident bears a striking similarity with a typical scenario at an advertising agency or a design studio, when a creative brief is collected from a client. To my surprise, I could suddenly relate myself to the client who fails to receive his desired results from the advertising agency, and that prompted me to write this article on how to collect a comprehensive creative brief from your client. A creative brief is an integral part of the client servicing process that may lead to the success or failure of the project produced. A creative brief is a descriptive document that contains information about the client, and which explains your client’s requirements for the project. From individual professional designers to most advanced advertising agencies and design houses, everyone strives to collect a comprehensively written creative brief. It helps them in eliminating any ambiguities in the design process so that it may not end up as a ‘Chinese whispers’ game. In order to collect a comprehensive creative brief from your client, I suggest you develop a document with the following details in it. First things first, the most basic information required from a client is about his company. You need to ask the client several questions including the company’s products/services, vision and mission, historical background, achievements and successful campaigns etc. This should also include information about the advertising agencies and design studios which they have worked for or with, previously and what they expect from your services. This is relevant for new clients. If you are working with an existing client, then this information is not much required. Without a target, it’s no use how good a throw you can make – your throw will be aimless. It is the same with a design campaign, where if you don’t know about your target market, your message will wander around and trail off aimlessly. Therefore, asking the client about the target market of the project is important so that you may design your communication with a focused mind. Knowing about the deliverables can save you a lot of time and resources. Ask your client about the required medium of the campaign i.e. BTL (Below The Line), print medium or virtual medium campaign. Also ask about the elements of campaign, for instance; flyers, brochures, leaflets, in-store branding web banner or print advertisement? This will help you to focus on the required deliverables only. Note: Do not forget to ask your client about the sizes and dimensions of the required marketing material. You cannot expect your designers (or yourself) to work on a project by taking oral notes only. In order to produce better results, you need to ask about all the related information material of the project. This can be the information gathered from company’s internal research department (or from an outsourced research organization), already existing brochures or booklets (in case of a project re-launch) or sometimes just the company’s website. Whatever the source of information is, try to squeeze as much information out of your client as possible. You will only be able to design the best results when you would know what the client wants to get out of it. Asking the client about the expected goals and gains will streamline your concepts and communication strategy. Also, in order to be on the safe side, ask your client to be very specific about the goals i.e. saying “increase sales” doesn’t mean anything, instead “Increase sales by 30%” is a measurable and thus achievable goal. Ask your client about his budget regarding this project’s campaign. This will ease your work and give you (or your designers) a perimeter to work within. If you overlook the budget, what may happen is that you had designed a campaign that is too expensive to run, and you have to go back to modifying the design, or start from scratch because you breached the budget. The last thing, yet perhaps most crucial thing to ask the client, is the expected deadline of project delivery. A specific timeframe is always good for efficient progress of the work in hand. Ask the client to not only specify the final deadline of project execution but to break down the time span into smaller milestones and give deadlines for those milestones as well e.g. deadline to deliver the first draft etc. This will enable a smooth flow of the project at both ends. No matter how comprehensive the information you gather for your creative brief, there will always be some blanks you need to fill in later. Always ask for a contact person from the client’s end. Preferably this person should be someone who can bridge the gap between the client and you. Although this is not directly relevant to your performance, you can ask the client who you are to present your work to (both initially and finally) and who is going to make the decision about your work. Once you know the persons, it may help you in preparing the designs according to the personal preferences of the decision makers. No matter if you are running a one-man show or are part of a giant pool of professionals, you need a well-documented creative brief to initiate a project. Creative briefs not only save you a lot of time and resources, but it’s document you can fall back on when the client starts changing his or her mind about how the project should move. A creative brief is your first link with a new project, therefore the stronger this link is, the more successful its execution will be. However, your creative brief can only be strong enough when it is detailed and comprehensive. Always remember that a client knows every bit about his project. Your job to enter and pick his brain for what can be used in the final design. Only then will you be able to perform at your most optimum.